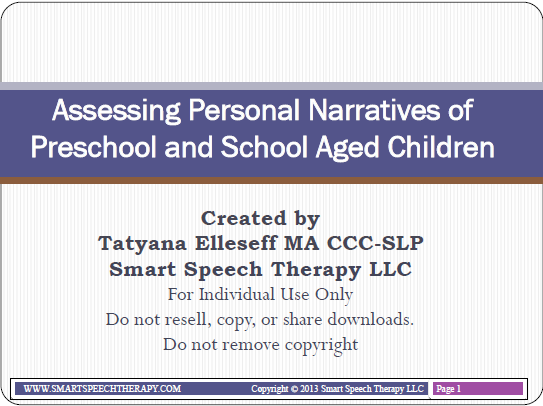 Recently I did a giveaway of my preschool speech language assessment checklist on my blog. I had so much fun doing it, that I decided I can’t just stop there, so I am going to do a giveaway of my school aged checklist as well. For those of you unfamiliar with it – it’s a 12 page guide, which I was created to assist speech language pathologists in the decision making process of how to select assessment instruments and prioritize assessment for school age children. My goal was to eliminate administration of unnecessary or irrelevant tests and focus on the administration of instruments directly targeting the areas of difficulty that the child presents with. Next post: Language therapy for children with severe cognitive impairments: Focus on Function! I would like to enter for free drawing of the school age student checklist.